Best Things in Beauty: Happy Bastille Day! Bastille Day is the name given in English-speaking countries to the French National Day, celebrated on the July 14 each year. In France, it is formally called La Fête Nationale (The National Celebration) and commonly Le quatorze juillet (the fourteenth of July). It commemorates the 1790 Fête de la Fédération, held on the first anniversary of the storming of the Bastille on July 14, 1789. The anniversary of the storming of the Bastille fortress-prison was seen as a symbol of the uprising of the modern nation and of the reconciliation of all the French inside the constitutional monarchy which preceded the First Republic during the French Revolution. Festivities and official ceremonies are being held all over France. We wish our French allies a wonderful holiday! We'll be celebrating with you in spirit. Hi Charlestongirl! Thank you for your kind wishes:-) I wish the weather were celebrating too...unfortunately we have a lovely November day!!!! "When the people fear the government, there is tyranny. When the government fears the people, there is liberty." (Attributed to Thomas Jefferson) That government was not the people's master, but rather it was there to serve them, was a concept that ignited revolutions on each side of the Atlantic within 15 years of each other. I think that shared experience in history will always bind France and the United States. 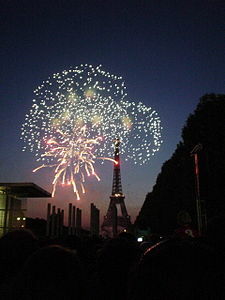 So, it is with joy and in the spirit of brotherhood that I wish all of France "Joyeux quatorze juillet!". Happy Bastille Day, Clarisse! I've read on Facebook how cold and rainy it has been in Europe. I think they need an arc in London. Heading off to the bakery, although German. Mr. Jefferson was, in my opinion, one of the most intelligent men - ever. We revere him in Virginia.